There are a lot of them. In the late 19th and early 20th centuries, postcards became a major means of communication, reflecting the emergence of good postal service and abundant railroad travel options. The first two decades of the 20th century are often considered the "golden age" of postcards, and this period coincided with the zenith of rail passenger travel in America. It was common for passengers to send postcards to friends or family to communicate their travel progress or just to stay in contact. 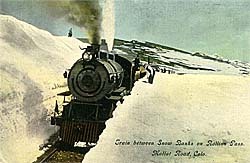 Railroads were a frequent subject of postcards. In the late 19th and early 20th centuries, railroads and their facilities had a prominent presence in the American landscape. Postcards of the era featured everything from railroad engineering landmarks to small-town stations. People tended to keep postcards as mementos rather than throw them away. Estate and garage sales often turn up old postcard collections, so that the number of postcards available to the collector continues to grow. Postcards are generally inexpensive relative to other railroad collectibles. 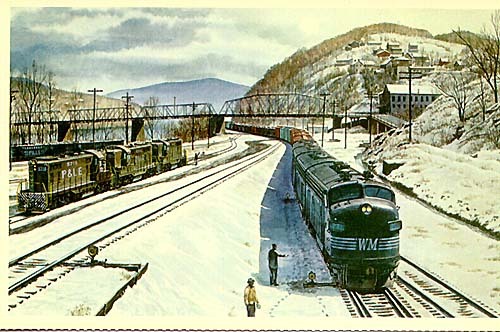 Of course like any other collectible, rarity can drive up prices, but it is still possible to buy decent railroad postcards for a few dollars or so. Engineering Landmarks. The engineering feats of railroad construction were a favorite subjects of postcards. 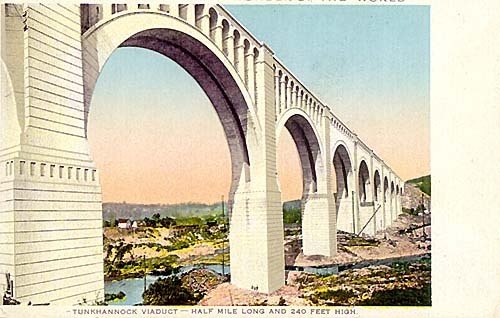 Dating from around 1915 and showing the clutter of recent construction, this postcard reads, "On the Lackawanna Railroad - Ninth Wonder of the world: Tunkhannock Viaduct - half mile long and 240 feet high." Click on the image for a larger view. Stations. 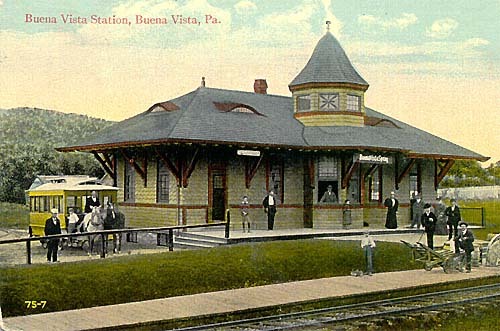 In an era when railroad stations were the major entry and departure points for communities, both small-town and big-city stations were the subject of postcards. 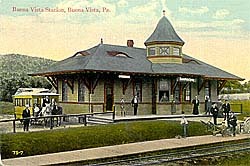 This scene, complete with horse-drawn trolley, depicts the Buena Vista Springs station (inked on the card) although the caption reads, "Buena Vista Station, Buena Vista, PA." Click on the image for a larger view. Scenery. 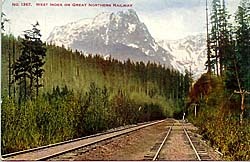 As railroads increasingly promoted tourist and vacation travel, postcard producers focused on scenery along railroad lines. Sometimes railroads produced their own postcards. With nary a train in site, the subject of this postcard is natural beauty. 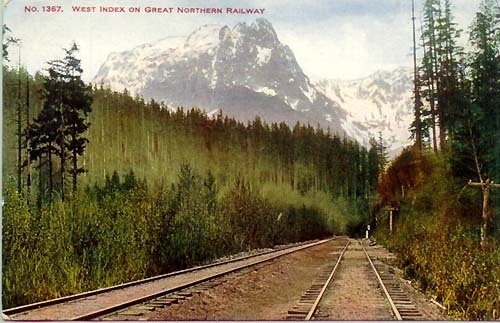 The caption reads, "West Index on Great Northern Railway," a scene in the North Cascade Range of Washington State. Click on the image for a larger view. Interiors. Postcards that show interiors of stations, other railroad buildings, or rolling stock are not very common, but they can be found. 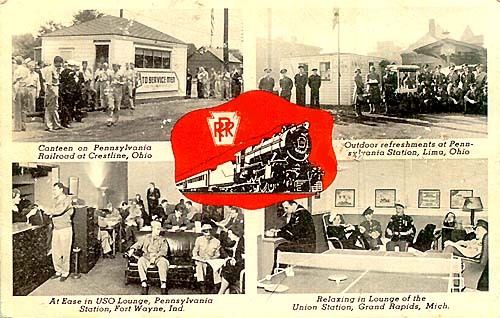 This World War II-era card shows a number of USO scenes, including interiors of USO lounges in the Pennsylvania Railroad's Fort Wayne, Indiana and Grand Rapids, Michigan stations. Click on the image for a larger view. Industrial Landscapes. 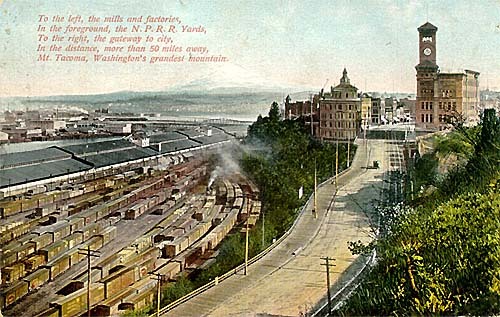 Once upon a time, the industrial scene was considered a mark of prosperity, and postcards frequently showed railroad facilities in urban settings. The caption here reads, " To the left, the mills and factories, In the foreground, the N.P.R.R. Yards, To the right, the gateway to the city, In the distance, more than 50 miles away, Mt. Tacoma, Washington's grandest mountain." Today the mountain is known as Mt. Rainier. Click on the image for a larger view. Troubles. Wrecks, disasters, and other difficulties were sometimes the subject of postcards, although we can assume these were not welcomed by railroad management. Judging by the number of laborers in this scene, a train on the "Moffat Road" is probably being dug out of one of the legendary snowfalls that plagued this line over Rollins Pass. The caption simply states, "Train between snow banks on Rollins Pass, Moffat Road, Colo." Click on the image for a larger view. Obscure Locations. One of the most interesting aspects of railroad postcards is the fact that many show rather obscure locations and facilities. For most railroadiana collectors, an interest in railroad history goes hand-in-hand with collecting, and postcards can provide a glimpse into a long-vanished past. In contrast to today's garish, tourist-oriented postcards, many early postcards focused on rather nondescript locations, for example a stretch of empty railroad tracks beside a river or a railroad yard. In particular, the "real photo postcard" -- a postcard produced from a monochrome, untinted photograph -- can function as an historical record, sometimes the only record of a location. Case in point: The Pittsburgh & Lake Erie (P&LE) Railroad's Dickerson Run Yard, near Connellsville, Pennsylvania. 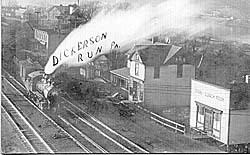 At the turn of the 20th Century, the P&LE developed Dickerson Run Yard to service the extensive coal fields of the Connellsville region, then considered the best source of coking coal in the world. The yard was located in a narrow, remote valley of the Youghiogheny River, very much off the beaten path. Few railroad photographers ventured into this region, and published photographs of the yard are rare. 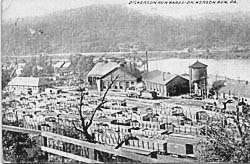 As the Connellsville coal fields gradually played out, the yard's strategic importance diminished, and it was entirely abandoned in 1970. Today the site is a second-growth forest bisected by the Youghiogheny River Rail-Trail on the old P&LE roadbed. With this level of obscurity, it would seem most unlikely that postcards of the Dickerson Run Yard would have been produced, but they were. In fact a number of them have turned up, all the more remarkable given the fact that this P&LE division was never a major long-distance passenger route like the nearby Baltimore & Ohio and Pennsylvania Railroad mainlines. The images below show a number of views of the yard, the first four dating to around 1910. The last is a reproduction of a painting of the area produced by Howard Fogg in the 1960's on commission from P&LE president, John Barringer. A whole series of lineside paintings by Fogg were reproduced by the railroad in numerous formats, including postcards. Above. 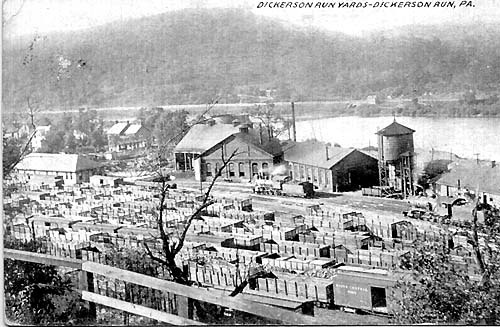 A real photo postcard titled "Dickerson Run Yards, Dickerson Run, PA.", with a 1910 postal cancellation on the back. Click on the image for a larger view. Above. 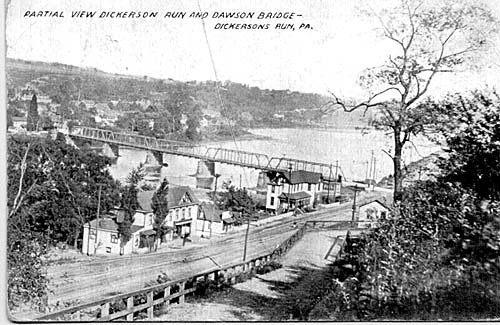 A real photo postcard titled "Partial View, Dickerson Run and Dawson Bridge - Dickerson Run, PA.", showing the Eastern end of the yard. The postal cancellation is dated 1911. Click on the image for a larger view. Above. A real photo postcard titled "P.&.L.E. 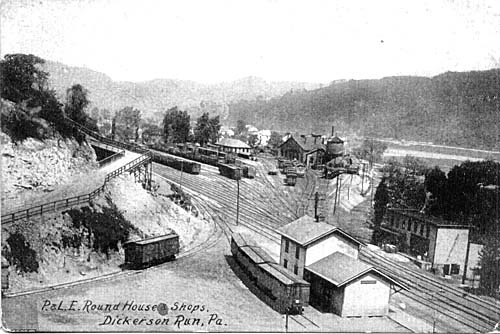 Roundhouse & Shops, Dickerson Run, PA.", unused (no postal cancellation). Click on the image for a larger view. Above. A real photo postcard with "Dickerson Run PA." neatly hand-printed in a light area. It is unused (no postal cancellation). Click on the image for a larger view. The structure next to the locomotive is shown from the other direction in the above postcard of the bridge. Left. A postcard showing a Howard Fogg painting from the series commissioned by P&LE president, John Barriger. The caption on the back of the card reads "Interchange with the Western Maryland Railway at P.& L.E. 's Dickerson Run Yard, near Connellsvile, from original painting by Howard Fogg." It is unused (no postal cancellation). Click on the image for a larger view. Summary and Links. If you have an interest in some obscure and long-forgotten railroad facility, consider looking for postcards of that location. You may be surprised at what you find. If you are looking for an antidote to railroadiana sticker shock, consider collecting postcards related to your favorite railroad. Prices can still be reasonable, postcard dealers are plentiful at antique shows, and the handwritten notes on the back of used postcards can be interesting and even poignant. Some links to postcard-related sites are shown below. An information source for dating postcards based on the "stamp box" on the back. Historical postcard views of the Southern Pacific Railroad, Central Pacific Railroad, Northern Pacific Railroad, and Spokane, Portland & Seattle Railway. Books about postcards and postcard collecting. A Tour of the USA in vintage postcards.